Why does this book matter so much to me? Why do I want people to read it and think about their skills from new angles? And why am I publishing another book and asking you to pre-order it on Kickstarter? Also, where did the title come from anyway? Last February, I was in New York shipping rewards to the supporters of my previous campaign. It was about three months into my life as a freelancer and it was also the first month I didn’t send out a single invoice, nor did I have any client work lined up. Surprise! Surprise! Freelancing is a rollercoaster. We all have heard that, right? Getting good clients and staying true to your personal mission are very high expectations when you are just starting out. Good clients don’t knock on your door day in, day out. Especially when you are just beginning, one way to deal with a month without any work or invoices is looking for side gigs that you may not necessarily care for. There are millions of platforms that connect you to clients anonymously. It’s a market where you compete based on your price. The other possibility to deal with such a limbo is going back to waiting tables. It’s an option, or at least one I’ve always kept in the back of my mind. But then, I thought there must be another solution to make a living as a creative freelancer. After all, it’s the age of the social web! There must be millions of possibilities! I began looking for answers and strategies to build income streams independent of other people’s timing and budget. I was looking for a solution that would work on my terms. So how did I go about my research? How did I choose who to interview and how did I find these incredible women? Given how well it worked the first time around, when I just approached the people I admired for what they were doing, I thought, why not try the same strategy again? While last time I knew almost every single person I interviewed, this time around, I was sending emails to strangers trying to learn from their way of thinking. I got personal recommendations, I found people in news articles, or I approached people who have been on my radar for a while. I got rejections. I got enthusiasm. I got honest answers and most importantly, I got the answers I was looking for. 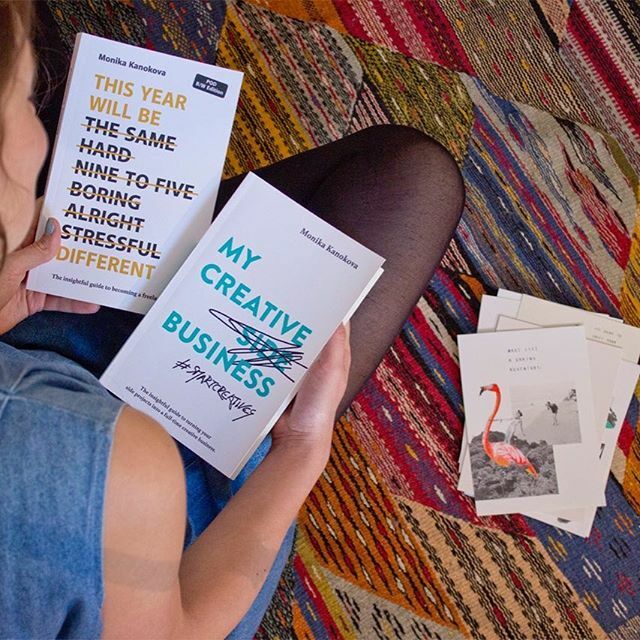 So where does the title “My Creative (Side) Business” come from? A title that I got criticized for too, mind you. The title comes from a realization I had after talking to several different women who shared how they built their businesses. For many, at first, what they do now full-time started as a hobby. They found ways to monetize their side projects and at some point, after years or sometimes just a few months for the lucky ones, it became a project that was making them enough money to be able to focus on it full-time. Because they have seen this technique work once, they tried it again. They changed their perspective. They did something new. They continued reflecting on their skills and playing around with the possibilities of the internet, social media, and online marketplaces. The title really should be “My Creative (Side) Businesses,” given that none of the women I interviewed is putting everything on one card. Stability in business goes hand in hand with having multiple pillars supporting it. Every interview featured in #MCFSB that you’ll read will help you realize the many opportunities waiting for you. And every article I have written will help you apply ideas to your own unique, personal situation. You will find examples of moms and how they work to be able to spend time with their kids. You will learn what you can do to be able to become location independent. You will get a chance to reflect how to use your skills if you are suddenly forced to think of a plan B. And you’ll be able to think about what to do when you run out of clients to help you pay your bills. If what I have described above is something you are curious about, I would really appreciate if you could reserve your copy now. It’s the only time I can make it extra special and send you an actual gift, and who doesn't like gifts? If you have already pre-ordered your copy, thank you! You are the best! I will make your pledge worthwhile, I promise. As for me, personally, I cannot wait to send you the finished book! I use Kickstarter to be able to pay my team, the people I enjoy working with the most, promptly. PS: Please send our Kickstarter link to friends who you think might appreciate reading the guide. Thanks so much for being awesome! Let’s make this happen together!